This just made me feel sick. Lord have mercy!! (UOC-USA) We ask all who read these words to keep the parish family of St. Andrew, Los Angeles, CA in their prayers during these difficult days. 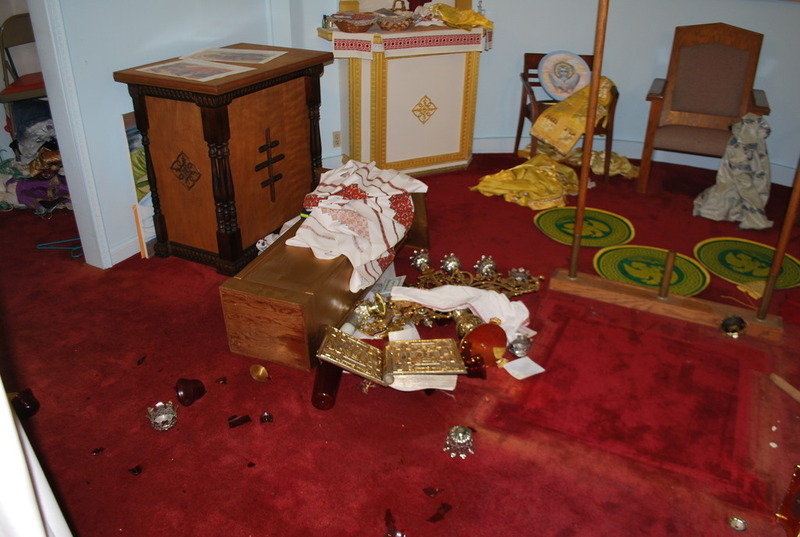 In the early morning hours of 15 August, an intruder broke into the parish Church and desecrated the Holy Altar, Tabernacle, Iconography and the entire altar and sacristy area. 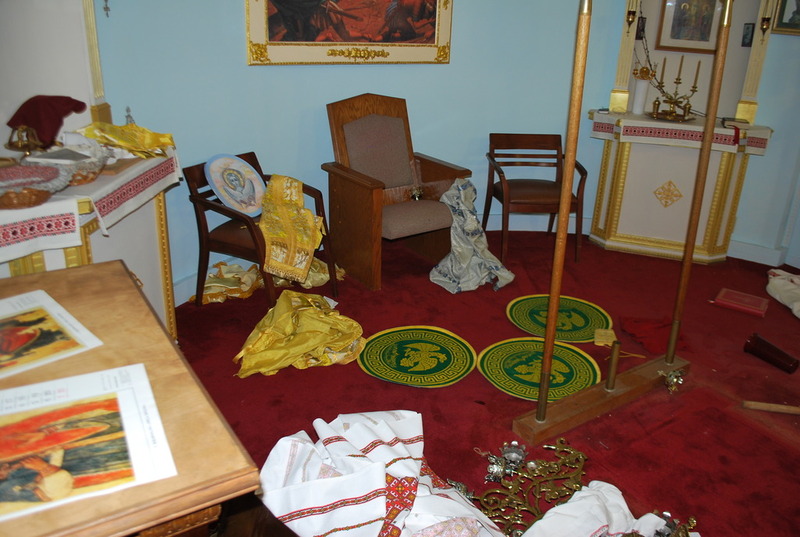 The most devastating aspect of this horrendous crime was the scattering of the Reserve Sacrament on the floor among and beneath the various altar crosses, candles and vestments strewn throughout the church. 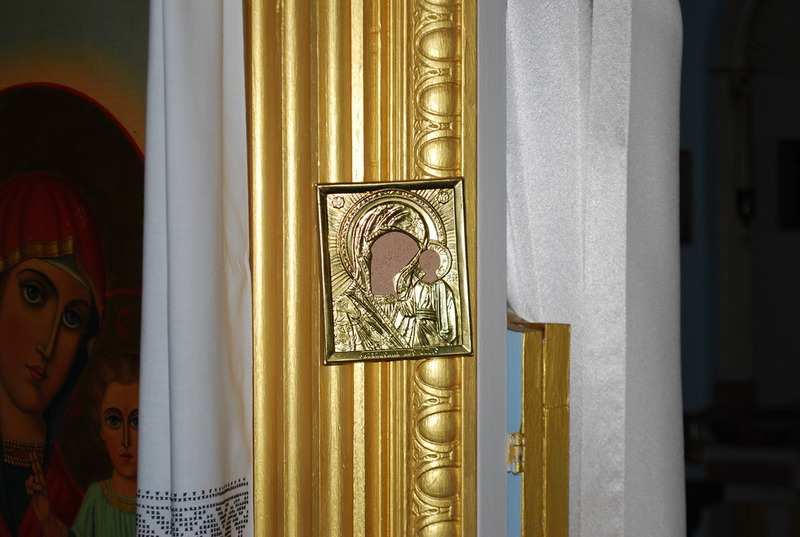 The Holy Altar itself was pulled from its foundation and dragged through the Royal Doors into the nave of the church. It was a senseless act of destruction and obvious anger that left the Church and the neighboring community in much distress. Father Vasyl Shtelen and members of the parish were able, following the completion of the police investigation and the insurance examination, to gather the scattered religious vessels and items, clean them and bless them through special prayers and sprinkling with Holy Water in time for the celebration of Divine Liturgy on the Great Holy Day of the Transfiguration of our Lord. We pray that Father Vasyl and the members of his flock were able to experience the Glory and presence of our Lord on this Feast, saying, as did the Apostle Peter – “Lord, it is good for us to be here” – in spite of the obvious hurt and sorrow they have experienced. We assure Father Vasyl and all St. Andrew Parish members of our continued prayers. Insurance coverage will most likely cover most of the expenses to repair or replace many of the damaged vessels, vestments and other items, there will most certainly be additional expenses. Any parishes, organizations or individuals who might care to offer contributions to assist our brothers and sisters will be appreciated more than words can express. 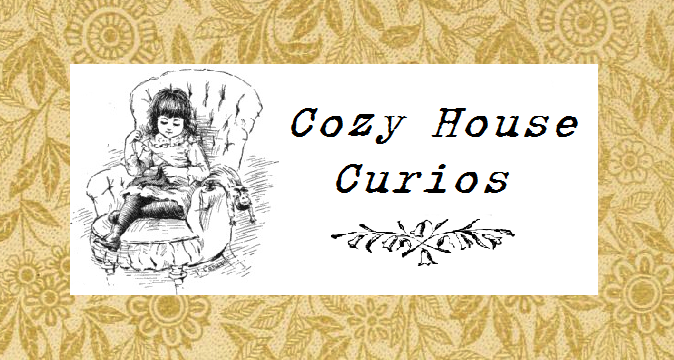 Donations may be sent to the Consistory, which has established a special fund. All contributions will be listed and accompany the funds when they are forwarded to the parish. This gave me cold chills. Lord have mercy. This is horrendous! I hope they are caught. Mercy is when you don't get what you deserve. Justice is when you get what you deserve. I hope they are cuaght and made to do restitution through community service, after the other things our justice system will mandate. Sometimes it does help to sensitize someone. Prayers for this church and its parishoners! So horrendous! I am speechless.